We are a leading Manufacturer of Single Chamber SS Autoclave, Double Chamber SS Autoclave, Horizontal High Pressure Autoclave, Horizontal Autoclave, Industrial Autoclave and Boiler Autoclave from Vadodara, India. Sterilization autoclaves are widely used in microbiology,medicine, podiatry, tattooing, body piercing, veterinary science, mycology, dentistry, and prosthetics fabrication. We are the manufacturers of all types of vertical and Horizontal autoclave for industrial and research institutes and Company and hospital. · Electrically heated vertical sterilizer is used for sterilization under saturated steam pressure at any selected point between 10 to 20 psi (adjustable). The unit is double walled with boiler made of 18 SWG stainless steel sheet. Outer cover is made up of mild steel duly enamel painted. The space between boiler and outer cover is provided with air insulation. Lid is made up of stainless Steel plate and is tightened by wing nuts/radial locking system. This unit is completely made up of stainless steel having pressure top and ring and completely argon arc welded. This is having double safety valve, pressure gauge, water level indicator, chamber drain, water inlet funnel, steam release. This unit is completely made up of stainless steel having pressure top and ring and completely argon arc welded. this is having double safety valve, pressure gauge, water level indicator ,chamber drain, water inlet funnel, steam release. Available in regular size and single / double chamber and horizontal & vertical..
Purge cold air release automatic. Speed autoclave 35 min cycle. Sterilization autoclaves are widely used in microbiology, medicine, podiatry, tattooing, body piercing, veterinary science, mycology, dentistry, and prosthetics fabrication. The electrically heated vertical sterilizer is used for sterilization under saturated steam pressure at any selected point between 10 to 20 psi (adjustable). The unit is double walled with boiler made of 18 SWG stainless steel sheet. The outer cover is made up of mild steel duly enamel painted. The space between the boiler and outer cover is provided with air insulation. The lid is made up of Stainless Steel plate and is tightened by wing nuts/radial locking system. This unit is completely made up of stainless steel having pressure top and ring and completely argon arc welded. This is having a double safety valve, pressure gauge, water level indicator, chamber drain, water inlet funnel, steam release. This unit is completely made up of stainless steel having pressure top and ring and completely argon arc welded. this is having a double safety valve, pressure gauge, water level indicator, chamber drain, water inlet funnel, steam release. Available in regular size and single/double chamber and horizontal & vertical. 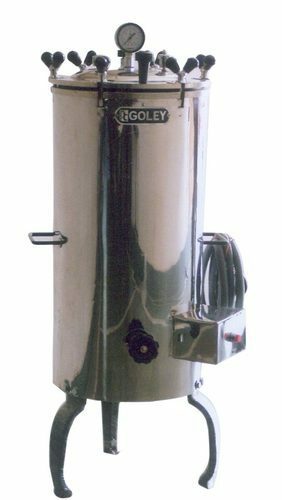 Electrically heated vertical sterilizer is used for sterilization under saturated steam pressure at any selected point between 10 to 20 psi (adjustable). The unit is double walled with boiler made of 18 SWG stainless steel sheet. Outer cover is made up of mild steel duly enamel painted. The space between boiler and outer cover is provided with air insulation. Lid is made up of stainless Steel plate and is tightened by wing nuts/radial locking system.